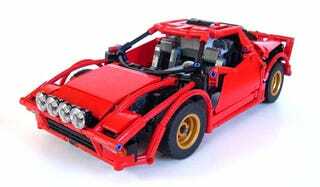 Robert Sorokanich shared this excellent Lancia Stratos built by Technic expert Piterx. Not unlike the actual car, this Stratos is a completely overpowered, slide happy machine. The twin motor, twin power supply Technic stuff channels my best Jeremy Clarkson "SPEEEEED!" and "POWAAAA!"